Even the casual sports fan has some tasty choice viewing options this week, including one you’re likely not expecting. The 2019 Major League Baseball season kicked off very early Wednesday, with a special advisory to be an early riser on the West Coast. The Seattle Mariners and Oakland Athletics began a two-game set inside Japan’s Tokyo Dome, with a game that began before The Rafu arrived on your doorstep, just after at 2:30 a.m. Pacific Time. For those who – like myself – stared bleary-eyed at the television in the wee hours of Wednesday, it was a somewhat magical moment to see Ichiro Suzuki take the field in his homeland, doing his best to focus on his craft while calmly absorbing the adulation of the 45,787 fans in attendance. Not to worry if you missed it; the same two teams play another game in Tokyo at the same time on Thursday. You might want to get in a nap beforehand, because it begins at – yawn – 2:35 a.m. on ESPN, and streaming over the internet on MLB.tv and WatchESPN. The Mariners’ new lefty star Yusei Kikuchi, formerly of the Seibu Lions – will start the second game of the series on Thursday. His major league debut is drawing crowds in Tokyo to the opening series every bit as much as Ichiro’s return. Though he has technically been signed to a minor league contract, Ichiro, perhaps the greatest player ever to pick up a bat, was given the start for Seattle in the opener. The 45-year-old future Hall of Famer is also expected to play in Thursday’s game, although whether he will start is unclear. After a spring training that saw him collect just two hits in 31 at bats, there is wild speculation over Ichiro’s inclusion on the Seattle roster once the Mariners return to the U.S. after the opening games in Tokyo. He has said that he hopes to play into his 50s, but much of the conversation during ESPN’s coverage on Wednesday wondered if Tokyo would be his last hurrah as a major leaguer. Of course, March Madness begins tomorrow, as college basketball will drive office sports conversations nationwide. In the West bracket, Gonzaga University is placed as the number one seed. 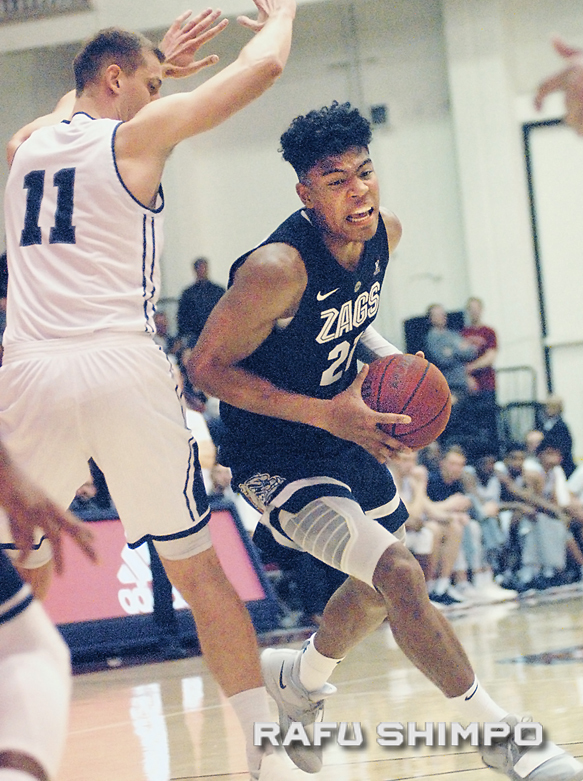 The Bulldogs are led by Japan’s Rui Hachimura, whose performance all season has fueled speculation about his likely drafting into the NBA after the college season is over. Gonzaga dominated the West Coast Conference, at one stretch posting 17 straight wins. Hachimura averaged 20.1 points per game, shooting 60 percent from the field and grabbing 6.6 per contest, over 33 games this season. Gonzaga will play its first game in the NCAA Tournament on Thursday against the No. 16 Fairleigh Dickinson Knights. Tomorrow’s game is scheduled for 4:27 p.m. Los Angeles time and will be broadcast on TruTV. Lastly, anyone who has followed sumo over the last few years certainly knows the name Hakuho. The Mongolian yokozuna (grand champion) is in fine form at the current March tournament, after fighting injuries for much of the last year or so. As of Wednesday, Hakuho has sole possession of the lead in the 15-day tournament, winning 11 matches without a loss. The last few nights have shown how masterful a wrestler he his, grabbing victories not only with raw strength, but also with cunning and dexterity. It’s been beautiful to watch. NHK World airs “Grand Sumo Highlights” several times throughout the day, and a live broadcast of the final day of competition is scheduled for 12:30 a.m. early Sunday morning. Again, you’ll be up quite late / very early. You can watch NHK World for free over the air, on KCET Channel 28.3. It is also on most cable systems, including AT&T (Ch. 1221), Cox Cable (Ch. 812), Comcast/Xfinity (Ch. 372) and Spectrum (Ch. 1227. 194, 199). Check your local cable provider or www3.nhk.or.jp/nhkworld for more information and air times. Happy viewing and get some sleep early!